Another Monday....Another one of MJ's wonderful Sketch Challenges. 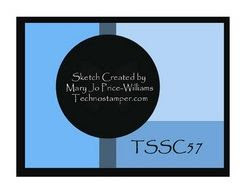 I can see this weeks sketch being used with a lot of sets I own. It's also a great sketch for color blocking. I started out by cutting my Parisian Breeze Specialty Paper for my panels, then ran them through my Big Shot, using the Texturz Plates. I then rubbed my sanding block on the raised areas, which removed the top layer of paper, giving it more of a distressed look. Once these pieces were adhered to my Baja Breeze card stock, I used my Mat Pack, Piercing Tool and Chocolate Chip marker to add the Faux Stitching. 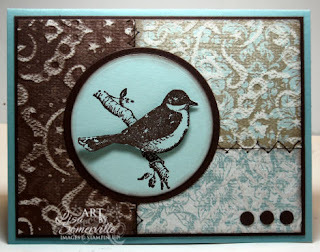 The focal image is from Friends 24-7, stamped on Baja Breeze, cut with Circle Nestibilities, then layered on a larger Chocolate Chip panel. 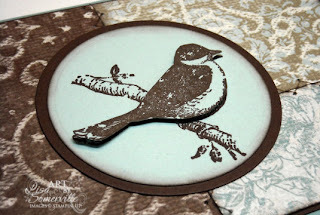 I stamped the bird again, and popped it up on top of the first one for some added dimension. Here's MJ's original sketch if you'd like to play along. Speaking of sketches/challenges...I'm excited to share with you that on Thursday's I'll be posting Challenges as part of Kerry's Three Clovers Thursday Inspiration Team! WOW! What an eye-catcher! This is my most favorite color combination and the way you used them is dynamic!I must try to case this one! Stunning my friend! Absolutely STUNNING!!! Splendiferous card!!! Though, I have to admit that this bird creeps me out...I am afraid of birds. I was worried that something was REALLY wrong with you when I didn't see the link on MJ's blog...you have not missed one yet! Phew! glad to see that the Earth is still spinning and you participated!!!! hahahahahahaha! I'm speechless! This is absolutely LOVELY! I love this. That is such a great bird and I love the colors you chose. I thought I already commented on this but I don't see it? Oh well, no idea, I am losing my mind lately. Thanks for playing, as always!